One of the best ways to lower your risk of cardiovascular disease is to eat 3.5 ounces of cooked fish at least twice weekly, says the American Heart Association. Not all fish are equally beneficial, however. 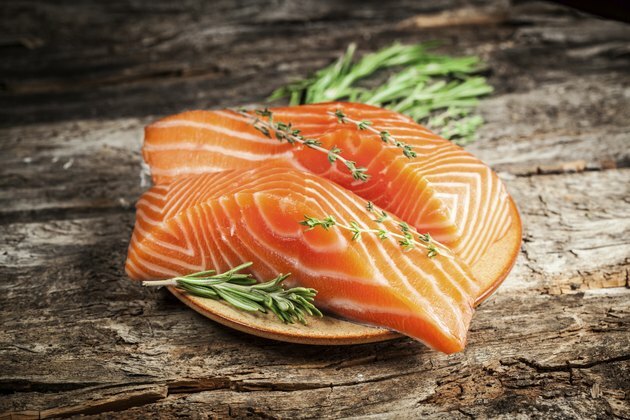 Certain varieties of oily cold-water fish are rich in heart-healthy omega-3 fatty acids while also low in potentially harmful contaminants such as mercury. Pregnant or nursing women, women who plan on becoming pregnant and young children should limit themselves to 12 ounces of low-mercury fish per week. Do not consume fish caught in local lakes or rivers until you have confirmed with local authorities that the fish is safe to eat. According to the Cleveland Clinic, Atlantic salmon is one of the richest sources of omega-3 fatty acids. A 3-ounce serving contains 1.9 grams, an amount that easily fulfills the Institute of Medicine's recommendation of 1.6 grams of omega-3 fatty acids per day for men and 1.1 grams for women. Salmon is extremely low in mercury, with only 0.01 parts per million in every 3 ounces. If fresh salmon is unavailable or beyond your budget, low-sodium canned salmon is a good alternative, with 1 gram of omega-3 fatty acids in a 3-ounce serving. Serve salmon with pasta, cooked whole grains or on top of mixed greens. With 1.9 grams of omega-3 fatty acids per serving, 3 ounces of herring is as good a source of the fats as salmon and is considered by the Natural Resources Defense Council as one of the least contaminated types of seafood. 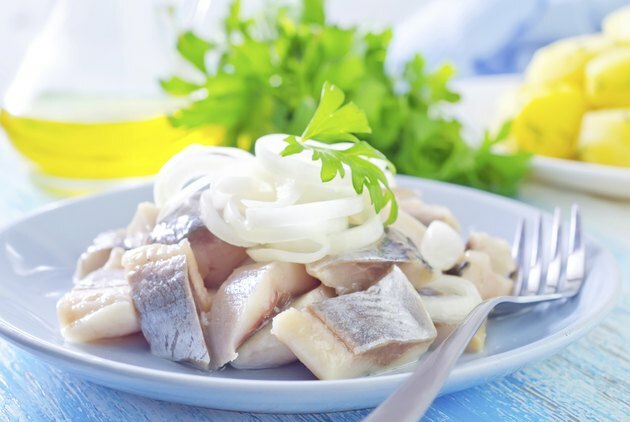 Whenever possible, it's best to choose fresh herring: Pickled and smoked herring is high in sodium, with over 240 milligrams of sodium in a single ounce, and oil- or cream-packed herring is high in fat and saturated fat. 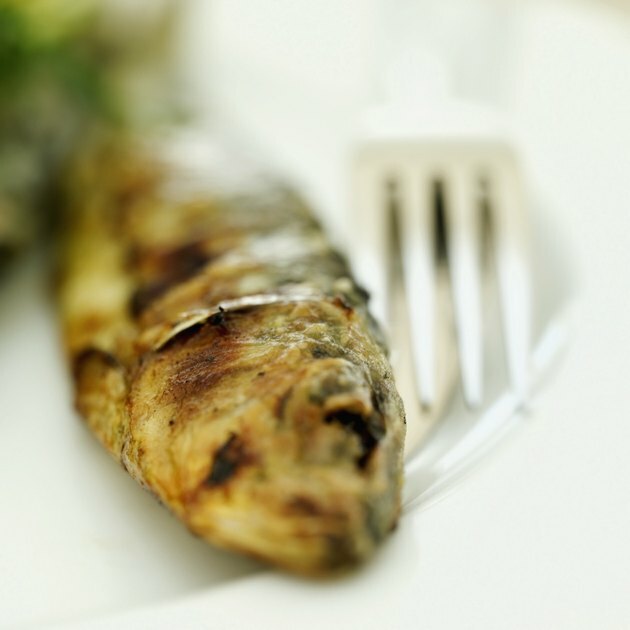 Grill whole or filleted herring and serve it with fresh vegetables and grilled whole-wheat bread slices. 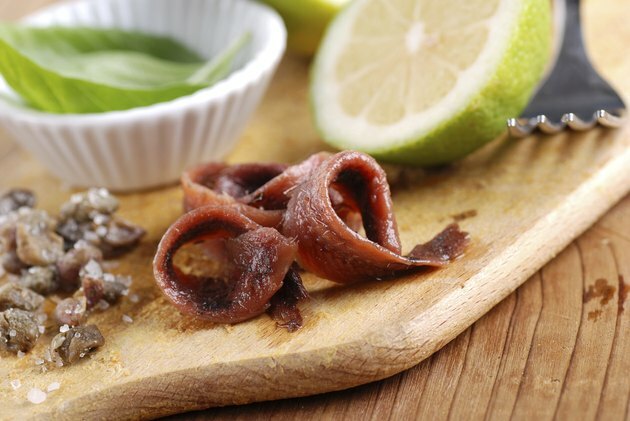 A 3-ounce serving of anchovies contains around 1.7 grams of omega-3 fatty acids. 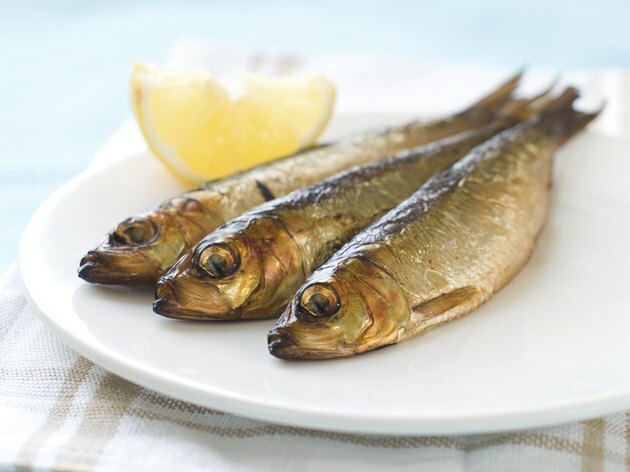 Anchovies are typically available packed in oil as fresh, pickled or cured fillets. If you're concerned about your sodium intake, consume anchovies only occasionally. Canned anchovies can contain as much as 1,000 milligrams of sodium in a single ounce, or over 40 percent of the 2,300-milligram daily sodium limit recommended for healthy adults. Experiment with drained, minced anchovies as a flavor enhancer in salad dressings or hearty pasta sauces before trying them on pizza or as the primary ingredient in a dish, suggests NPR writer Howard Yoon. The Kitchn food writer Anjali Prasertong calls sardines the super-fish of the seafood world. Low in mercury and economical, fresh and canned sardines contain approximately 1.4 to 1.5 grams of omega-3 fatty acids in every 3 ounces. If you're using canned sardines, use a brand that's packed in tomato sauce instead of oil for less fat and cholesterol, though be aware that both are high in sodium. Try broiling, grilling or pan-searing fresh sardines; use drained, canned sardines in sauces or as a topping for salads.